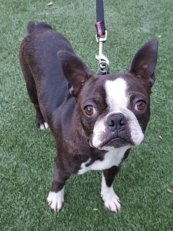 If you see a dog on our website before the next scheduled Pet Fair, PLEASE CALL THE NUMBER LISTED IN THE DOG'S DESCRIPTION to make a private appointment with the foster home to discuss your adoption options. Rocky is fully grown at a healthy 62 lbs. 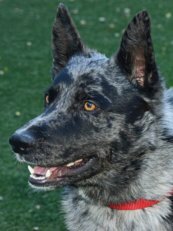 He is just as smart and full of energy as you would imagine a dog of this approximate breed mix to be. Rocky is good in the car and was good for his grooming - we blew out lots of shedding hair with the big dryer. He is leash trained and has a perfect Sit command, but still needs to work on learning some others. Rocky would be perfect for someone who wanted to do agility with him - he is food motivated and super attentive. 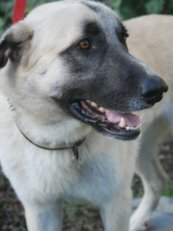 He is a playing machine with other dogs, and would love someone he can run and wrestle with, but does not need to live with another dog. Rocky can be vocal when chasing the squirrels on the fence (and has a big bark), but is not a constant barker. He is crate trained, but we do not know if he is housebroken. We do not believe he is ready to be in the house without supervision. He has a good temperament, but is too much dog for small children. Anakin is fully grown at a very thin 95 lbs. His proper weight will be in the 130 lb range. He is a gentle, loving soul that wants to be at your side whenever you're around. He wants to become a much loved and devoted companion. His instinct to watch over his flock is evident while he sits watchfully in the yard. Anakin is friendly with dogs of all sizes - even patient with the small young dogs - but his size may be a bit much for just any dog and too much for small children. Obedience training will be essential to fully enjoy his company. 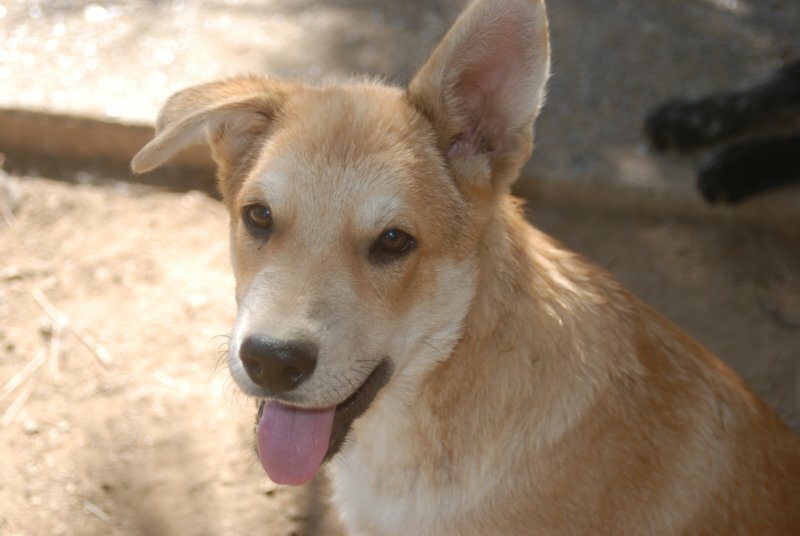 Anakin is vaccinated, microchipped, neutered, dewormed, and flea treated - all ready to meet a loving family. Breed experience is preferred. Butch is fully grown at about 20 lbs. 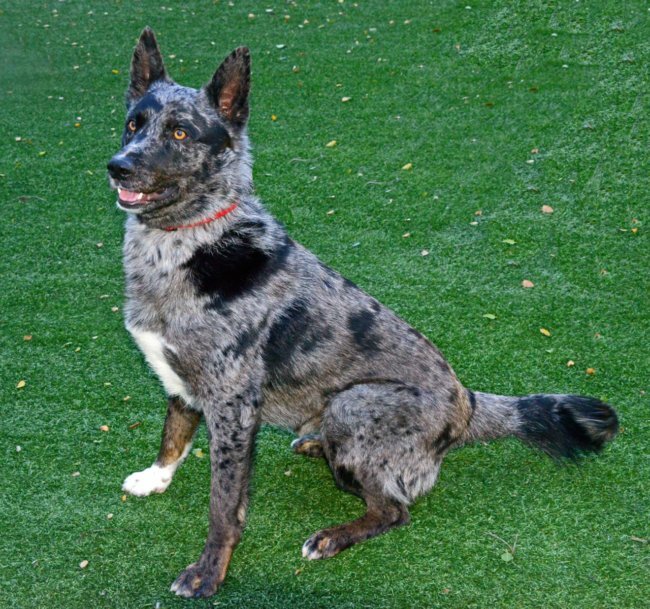 He is a very loving and affectionate pup, giving frequent kisses and has a very happy (and long) tail! 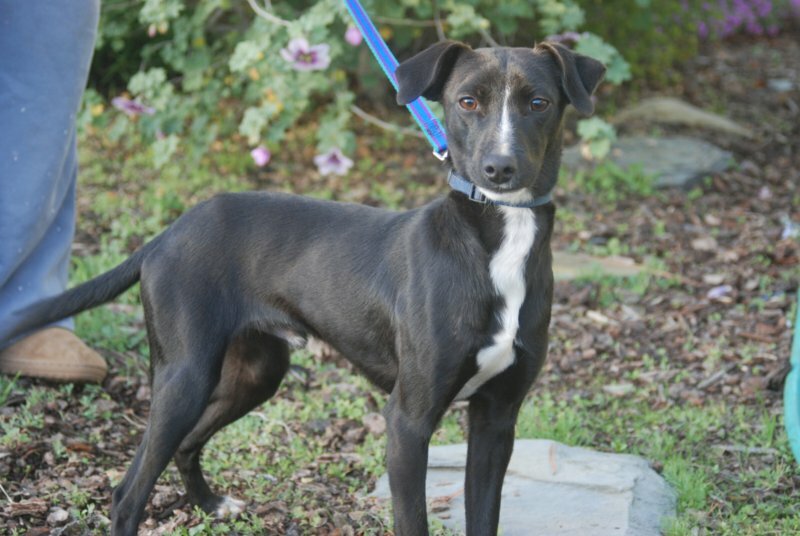 He is a playful, prancing boy who loves to run (very fast) and tumble with other dogs his size. Butch even gets along with cats and big dogs that aren't too rough. He should do fine with respectful children. Butch appears to be housebroken and knows how to use a dog door.. He is crate trained and rides well in the car. He is leash trained, but still needs to go to basic obedience training. 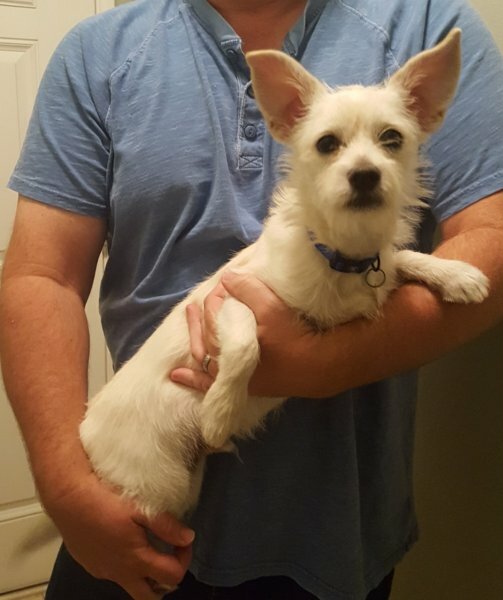 Butch is vaccinated, microchipped, neutered, dewormed, and flea treated - all ready to begin his life with a loving family. Meatball is fully grown at a lean 98 lbs. He is pretty much exactly how his breed is supposed to be - completely attached to his family, and reserved with strangers. Meatball was good for his bath and rides well in the car. He's crate trained, has had some obedience training, and is most probably housebroken. He's strong and bouncy and playful - fairly easily calmed if he gets to be too riled up. Meatball walks reasonably well on leash and is not leash reactive. He should be OK with another med/large female dog, but is not a candidate to live with cats. His ideal adopter will be able to set limits for him - not looking for alpha/dominance, but if you're too much a marshmallow personality, he will pick up on it and take the lead with what he perceives to be his protection duties. Meatball is a foster favorite. As always, we will be looking for a good match for both our adopting families and our dogs. Lala is fully grown at a lean 12 lbs. 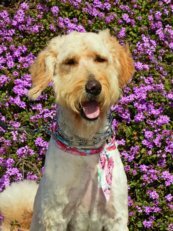 She is energetic, active and spunky - very busy before she settles down. Lala was good for her bath and rides well in the car. She is crate trained and may be housebroken. While she loves her walks, she needs to learn not to pull on the leash. 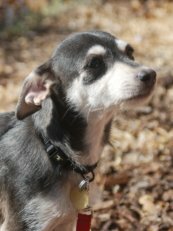 Lala gets along well with other dogs, but she can be too forward and scrabbly with quieter dogs. She is not a big barker, and does not snore when she's sleeping. This is a nice little dog that needs to go to obedience class. She is OK with cats (will run after them, but doesn't do anything to them) and should do well with children who are old enough to withstand being jumped/scrabbled on. Lily is fully grown at a slightly chunky 13 lbs. She is energetic, active and spunky - very busy before she settles down. Lily was good for her bath and rides well in the car. She is crate trained and may be housebroken. While she loves her walks, she needs to learn not to pull on the leash. 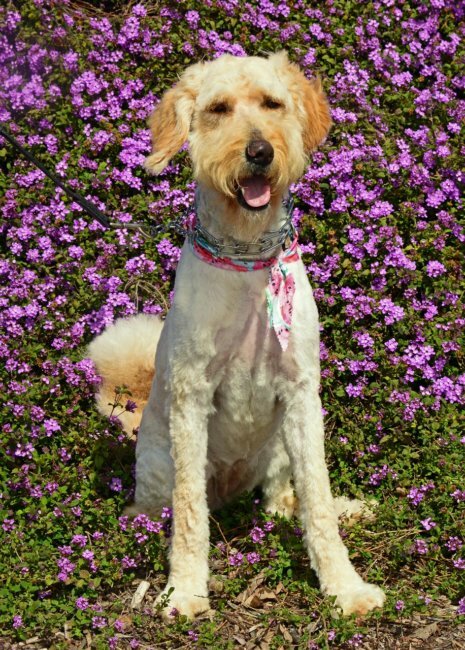 Lily gets along well with other dogs, but she can be too forward and scrabbly with quieter dogs. She is not a big barker, but she snores a steady buzzsaw when she's sleeping. This is a nice little dog that needs to go to obedience class. She is OK with cats (will run after them, but doesn't do anything to them) and should do well with children who are old enough to withstand being jumped/scrabbled on. Golly is fully grown at about 125-130 lbs. We got him after Animal Control confiscated him from his owners as he was hugely neglected and starved. We took him to an ophthalmologist to have a very painful dermoid cyst (benign) removed from the cornea of his left eye. His test was borderline as to whether he produces enough tears, so he needs to have eyedrops twice a day. The ophthalmologist will decide at a future checkup if drops can be discontinued. Golly is a bit of a ham and loves to get attention from his adoring fans. 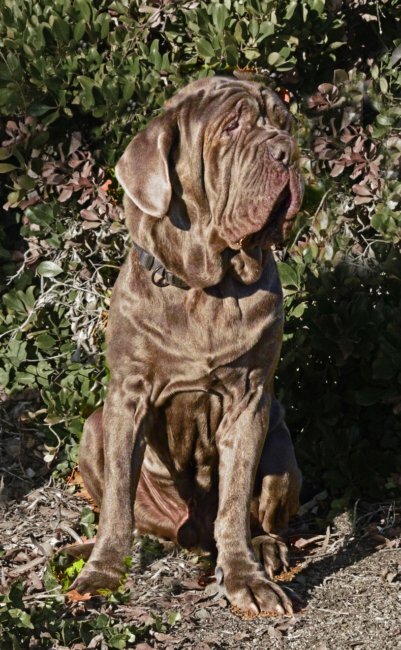 He is super strong and will need to go to a trainer to get him to stop pulling on leash. 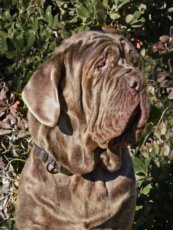 The challenge is that he has too many chins to wear a correction collar, and is not a candidate for a no-pull harness or a gentle leader. Golly should be OK with a large female dog or by himself. He seems pretty interested in cats and will bark at them; we don’t know if he’d hurt one or not. He’s generally a mellow guy. That said, IF someone gets him really riled up, he can go into hump mode. For that reason, we do not want to put him with small children. He is great for his baths right down to having a high-velocity blow dryer used on him; he stands for it just fine. In spite of having a huge puddle of face, he is not a constant drooler. He will drool for a short time after eating or drinking. Other than that, he’s got a pretty dry mouth. 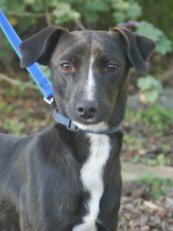 He is crate trained and may be housebroken, but we recommend he wear a belly band for the first week or so in a new home just in case. He will get into trash and any other food items that are within his reach. He barks/whines from his crate when he needs to go outside, when he believes it’s time for his meals, and when he believes he’s been outside too long. He does not snore, and is not as gassy as many mastiffs can be. He’s vaccinated, dewormed, de-flea’d, groomed, and microchipped. You’ll get a ton of attention when taking him out in public – he’s a true showstopper! Turbo is currently 9 lbs and is expected to be in the 10-15 pound range when full grown. He comes by his name quite honestly as this little boy loves to zoom around. He’s not bouncy so much as he wants to just jam at full speed, and finds it exceptionally fun to chase whatever will run from him. 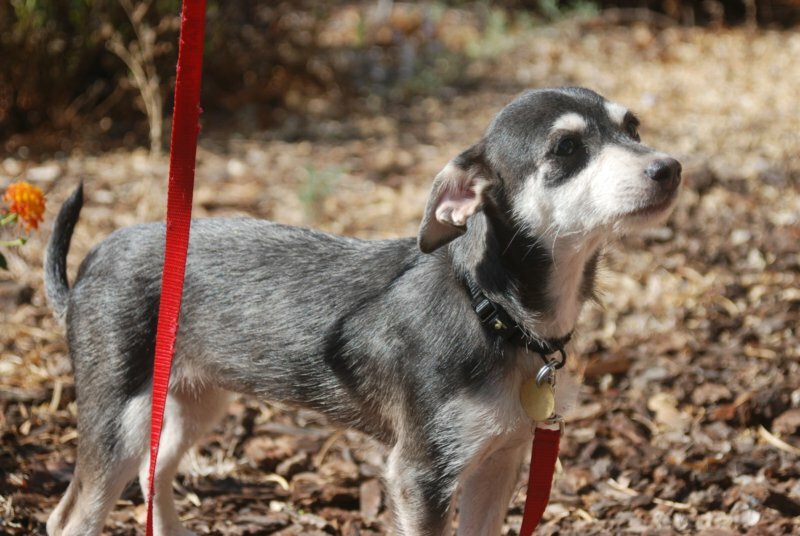 Turbo is full of personality and is just happy to be around anyone who will have him. We have crate trained Turbo, but he will need a full course of obedience training as he is just a baby. He was good for his grooming, and is pretty good at entertaining himself with his toys when he needs to. Turbo should get along with other dogs who won’t consider him a pest, and, while he doesn’t eat cats, he sure does like to chase them around. He should do fine with school aged children; he is likely too much dog for toddlers. 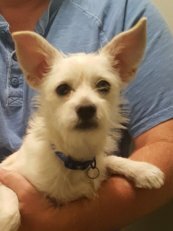 Turbo is neutered, vaccinated, dewormed, flea treated and microchipped. Brutus is fully grown at a healthy 72 lbs. 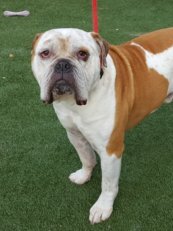 He is a big, mellow boy who loves to hang out with his people when he’s not napping in the sun. 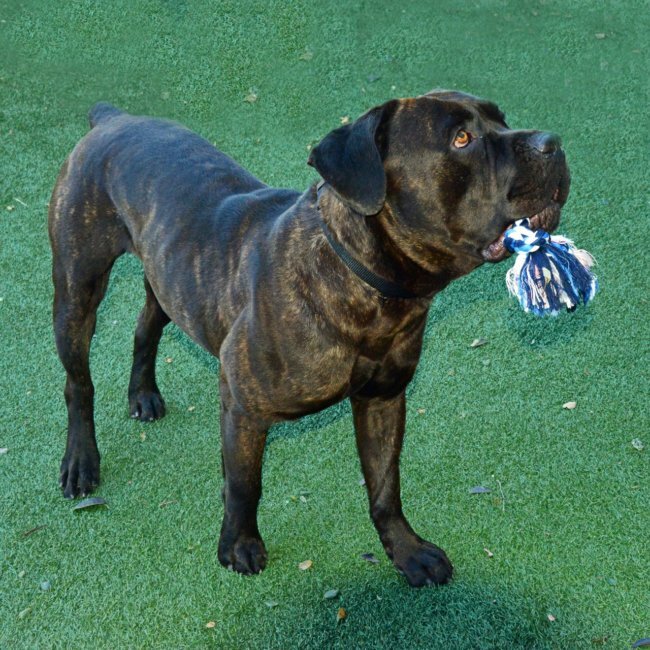 Brutus is great on leash and is an easy walking companion. He was great for his bath, is housebroken, knows sit/stay, and sleeps in the house on his giant dog bed at night. Brutus also rides well in the car and will even hop in for you. (He should have help getting out so he doesn’t injure himself.) He could live with school-age kids or another well-matched dog, but is not a candidate to live with cats or other small animals. 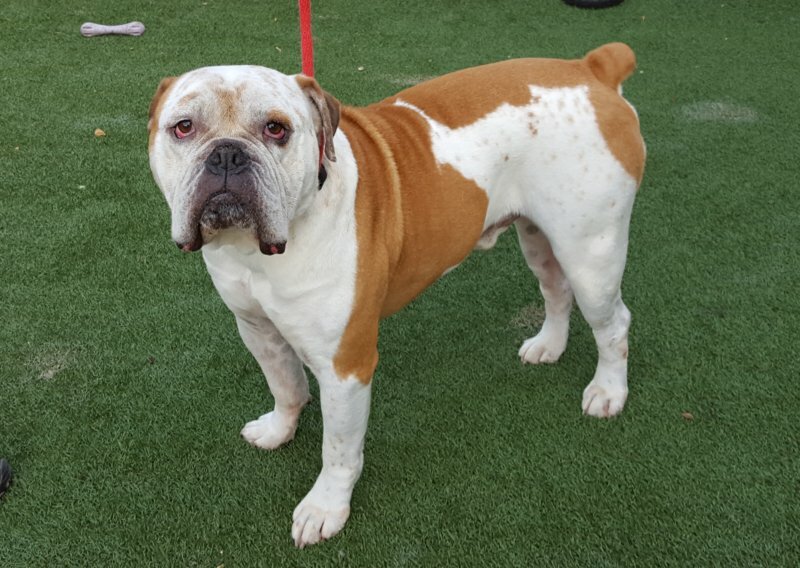 Like all bullies, Brutus can be stubborn at times and will need a firm (yet gentle) owner willing to continue his obedience training. He is not a heavy drooler, but he can snore with the best of them! Finn is still growing and currently weighs 35 lbs. Its unknown how large he'll be when fully grown but he could grow into a big boy. He follows at your side when walking about the yard and will quickly sit to receive head scratches. Finn is learning his manners but still needs work. He sits to receive his meal and seems willing to learn, but he still wants to jump when greeting you, although that has improved a lot since his arrival. He is extremely social with other dogs and loves to play. 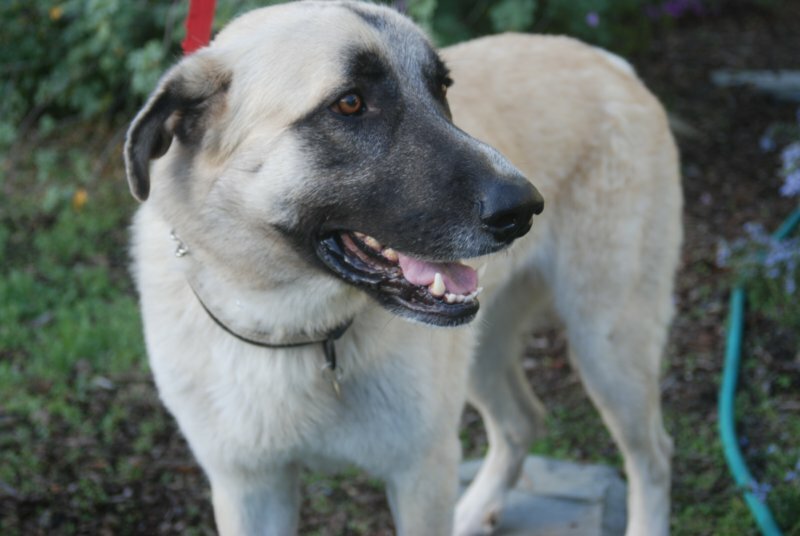 Finn just seeks affection and will be totally devoted to his family. He is neutered, vaccinated, dewormed and microchipped. He appears to be housebroken but should not be left unsupervised until confirmed. Thelma is a tiny little girl at about 8 lbs. She is not expected to get big but could weigh up to 15 lbs or more when fully grown. She was shy at first but quickly adapted and found the most comfortable spots in the house. She loves to play with other small dogs (and makes attempts with larger dogs) but also is happy nestled on a soft bed or better yet a lap. Thelma loves chew toys of all types, laps, soft beds and fluffy nesting blankets. She will have all of the normal puppy tendencies so be prepared for the curiosity, chewing etc. although she has so far kept to chew toys/bones. She is crate trained but as a puppy still needs out early in the morning. She is spayed, vaccinated, dewormed and microchipped. She is working on housetraining and should not be left unsupervised until her training is completed. Available dogs change rapidly. This page will be updated at least weekly and more often as needed. Not all available dogs will have pictures. Our dogs are available for adoption by appointment (call the number listed with the dog's picture for an appointment) through our foster homes, and at our weekly Pet Fairs. 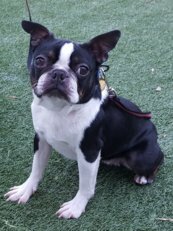 Although our primary focus is purebred dogs, we will have mixed breed dogs available as foster space permits. All dogs are spayed / neutered (no exceptions) and have all shots updated. They have been vet checked, wormed, and necessary treatments have been started. You will receive any medications they may currently need. Each dog has been groomed. You also receive a free vet examination. We are funded solely by adoption fees and private donations sent by people like you who care about our dogs. If you would like to make a donation to help with medical expenses for any of our dogs we would greatly appreciate it. Our rescue efforts would not be possible with out the support and generosity of the many friends of rescue who like to participate and help these furry kids. 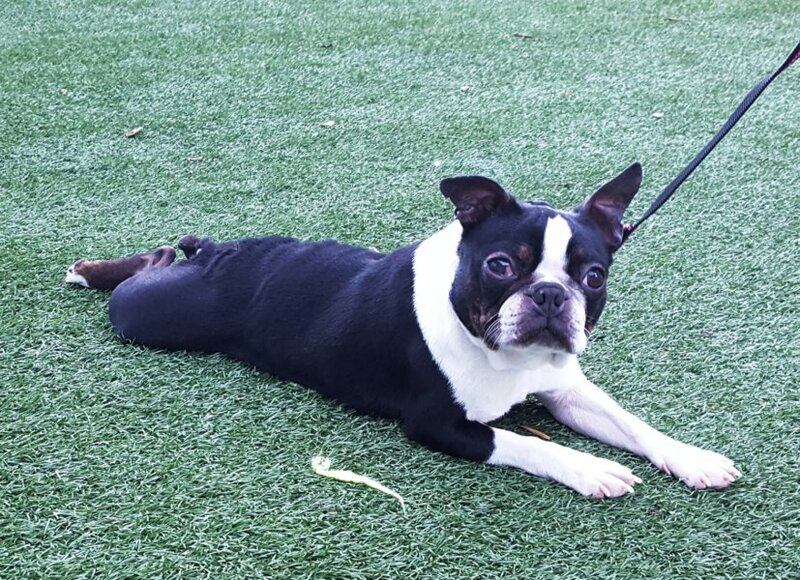 To sponsor any dog on this page, click the donation button under the dog's picture and be sure to write the dog's name in the comments section of the PayPal form. As always, all donations are fully tax deductable. Thanks for your support. most of them are adopted already? Many of the dogs we get are not ready for adoption right away. Only dogs that are ready will go up on the website. 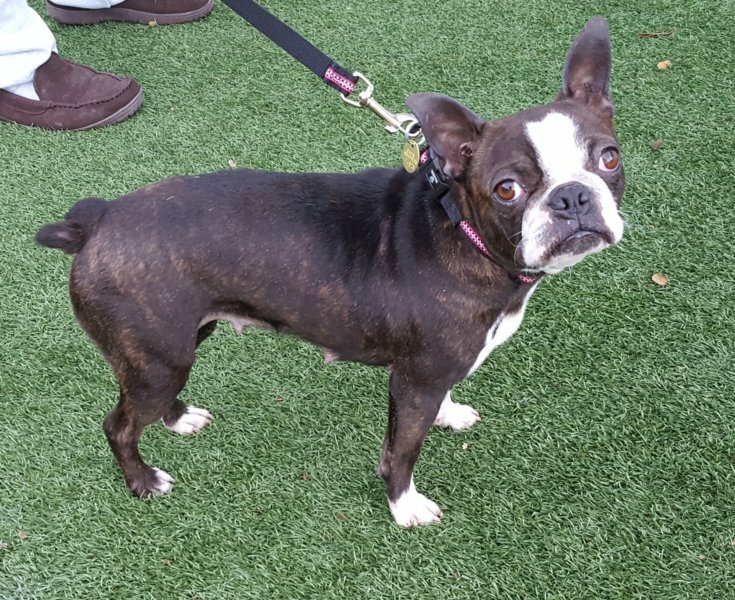 If the dog becomes ready for adoption just before a Pet Fair, it will probably be adopted from the Pet Fair before it ever makes it to the website. 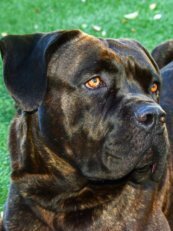 Often people will call us looking for a specific breed and we will place the dog with them before it ever makes it to the website. Our foster homes work full time outside of the home and have families to care for. Often we just don't have the time to get a picture and a description up on the web rapidly but we do try. So watch the web, call us, and come to the Pet Fairs. You have to be actively searching for a dog while we do our best to save them from the shelters and make them ready for you to find. 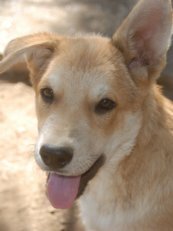 As soon as the webmaster is notified that a dog is ready or has been adopted, the website will be updated.